Do I have to be a member of FC Dallas Youth Club to attend? Not at all. 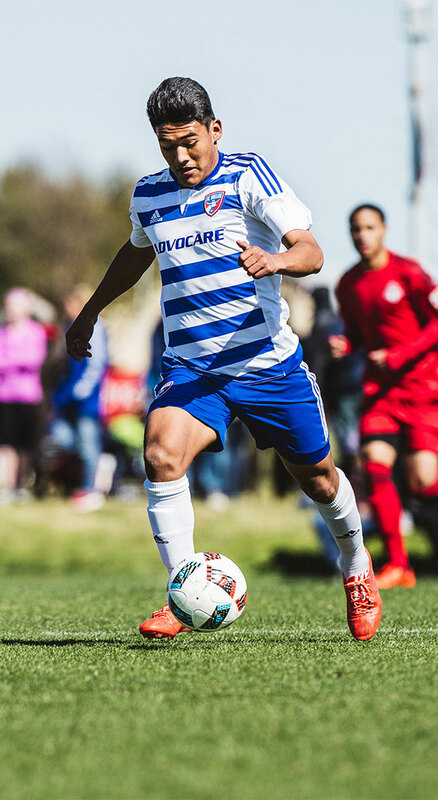 The FC Dallas School of Excellence Camps are offered by the professional team. All Camps are open to any player, regardless of club/team affiliation, who is interested in improving their skills and developing proper techniques that will help development. No skills releases are required. What should I bring the training program and what should I wear? Players should bring shin guards, soccer cleats, and footwear appropriate for use on a turf surface. Each player must also have a parent or guardian sign the waiver and release form prior to participating in the program. Players at the Residential Camps will receive a suggested packing list in their confirmation packet. Do participants need to bring their own water? Yes, players need to bring their own water jug to drink from. Drinking stations will be at each location and water will always be available. Do participants need to bring a snack or lunch? On YPD and Junior Camps, each player needs to bring his/her own snack. On Advanced Camps, each player needs to bring their own lunch, which will be stored indoors. On the Residential Camps all meals are included in the camp. Is your training program for boys only? No, all of our training programs are for both boys and girls. Is there any specialized goalkeeper training? We have an Elite GK program available at our Residential Camps Specialized. On our youth camps goalkeeper training will be offered. Are there any team or family discounts available? What is your instructor to player ratio? Our instructor to player ratio is typically 1:12. Instructors will also rotate and work with different age groups throughout the week. How do I register and secure my space? www.fcdallascamps.com and if the camp is open you can register! What if I am having trouble or experiencing technical difficulty while registering online? What if a camp is sold out, do you have a waitlist? We can review individual groups at each camp and add additional players. Please email cclarke@fcdallas.com with the players’ details. If it rains will the training program be cancelled? No, unless weather conditions become too dangerous. Some of the programs are held on artificial turf fields that are capable of handling rain. Parents will be able to call our hotline at (469) 365-0021. If we do lose time due to weather issues, we will add time to the remaining days at camp, which may include adding Fridays to the schedule. What happens if I get sick or injured and cannot attend, do I get a refund? Please review the Registration Policy in the confirmation materials.